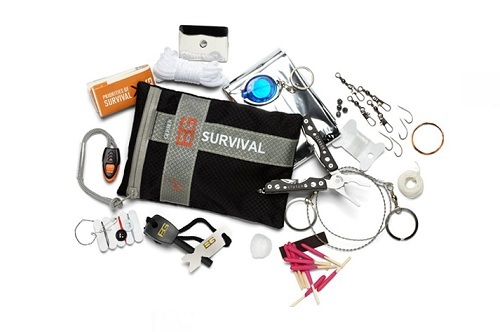 The product of collaboration between Gerber and survival expert Bear Grylls, the Ultimate Kit is a 15-piece survival kit built for hostile environments. It fits in your pack and has everything you need--including Gerber's miniature multi-tool, a fire starter, a survival blanket, and a wire cutter--to survive even in the toughest spots. The Ultimate Kit is part of the Gerber Bear Grylls Survival Series of gear. This collaboration brings together Gerber's 70+ years of knife and gear expertise with Bear Grylls' extensive outdoor survival and adventure experience to create a one-of-a-kind line of knives, tools, and gear. Ideal for hard-core outdoor adventurers, the Ultimate Kit has everything you need to stay safe and alive until you can be rescued or rescue yourself. The 15-piece kit includes the Gerber miniature multi-tool, which offers stainless steel, weather-resistant components including needle nose pliers, wire cutters, fine edge and serrated knives, a Phillips screwdriver, small and medium flat drivers, a lanyard ring, a bottle opener, and tweezers. This tool's rugged construction and external components make it a reliable multi-tasker, even in the harshest environments. In addition to the multi-tool, the Ultimate Kit comes with a lightweight ripstop nylon bag with a waterproof zipper for weather-resistant storage and an array of tools and accessories, including a miniature light, a hand saw, a signaling mirror, a survival blanket, a fire starter, waterproof matches, cotton ball fire tinder, a snare wire, an emergency cord, waxed thread, a fishing kit, and a sewing kit. For added peace of mind and a higher level of preparedness, this kit comes with land to air rescue and SOS instructions. It also includes Bear Grylls' informative Priorities of Survival pocket guide, loaded with survival basics. Nylon pouch, multi-tool, miniature light, hand saw, signaling mirror, survival blanket, fire starter, waterproof matches, cotton ball fire tinder, snare wire, emergency cord, waxed thread, fishing kit, sewing kit, pocket survival guide, and rescue instructions.